Exciting times today, as we bring you news of a new ebook all about Twitter for bloggers, straight from the heart of KBC. 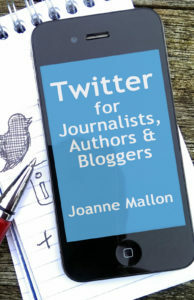 Twitter for Journalists, Authors and Bloggers is written by KidsBlogClub editor and founder Joanne Mallon. It explains Twitter in a very practical and easy-to-understand way for anyone who wants to use it to promote their writing. If you’re not sure how to use Twitter to promote your blog, then this book will tell you how, step-by-step. There’s also an action plan to help you gain your first 1,000 followers on Twitter. The Twitter for bloggers book is adapted, updated and expanded from Joanne’s last book, the highly acclaimed Social Media for Writers. It’s easy to assume that all bloggers are already on Twitter and using it happily and confidently. But as Joanne found out from running workshops with writers’ groups, that’s far from the case. Lots of people still just want to know what a hashtag is. If you’ve signed up to Twitter and never really got what all the fuss was about, or want to use it to promote your blog, then this is for you. If you don’t have a Kindle you can download the Kindle app to most smartphones, tablets and computers and use that to read Kindle books. Hello,I am a 14 year old new kid blogger.Please give me some advise to get my blog famous.